You can officially add leaping field goal blocks to the things the Patriots did well that the NFL decided to ban. Today, league owners passed a rule that will prevent players from jumping the center to block field goal and extra point attempts. One of the Patriots' biggest plays from the 2016-2017 came on this type of play. 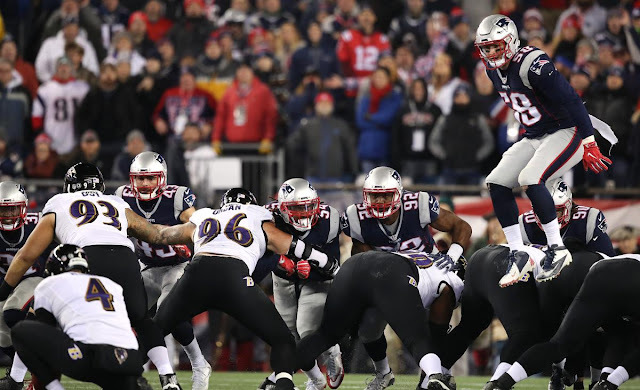 During a Monday night game against the Ravens late in the season, linebacker Shea McClellin jumped over the offensive line and blocked Ravens kicker Justin Tucker before the ball was even in the air, which kept the Patriots on top 2-0 at that point. McClellin tried the same play again in the Super Bowl and was flagged even though he shouldn't have been.